VoiceOver: Turn this setting on to hear an audible description of the buttons on the screen. With some practice, vision-impaired iPhone users can learn the tapping, double-clicking, and flicking movements necessary to use apps. Within VoiceOver, you can adjust the speaking rate, attach a Braille device, select which parts of a web screen you wish to have read, and which language you want VoiceOver to speak. Zoom: The Zoom feature enlarges the entire iPhone screen when you double-tap with three fingers. Use three fingers to move from left to right on the screen and one finger to move the screen up and down. Double-tap again with three fingers to return to normal size. You can’t use VoiceOver and Zoom simultaneously. Invert Colors: Turn this feature on and all color on the display is inverted, like a photo negative. Speak Selection: Turn this feature on to have iPhone read selected text out loud, even if VoiceOver is turned off. 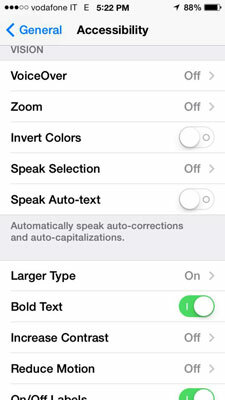 Speak Auto-text: Corrections iPhone makes automatically while you’re typing are spoken out loud if this function is turned on. Larger Type: Tap this item and then tap Larger Dynamic Type to the On position. 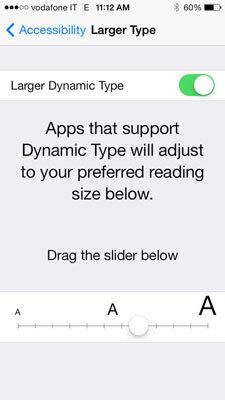 Move the slider to choose the type size that’s comfortable for you. Your choice is reflected in Calendar, Contacts, Mail, Messages, Notes, and Reader, as well as any other app that supports dynamic type. You can also tap Settings→General→Text Size to make this adjustment. Bold Text: Tap this option on and your iPhone restarts, and then all text on your iPhone shows up in a heavier, more pronounced typeface. Increase Contrast: When tapped on, the contrast on some backgrounds will be increased for better legibility. Reduce Motion: You may have noticed that as you tilt your iPhone it seems that the buttons or the background move a bit. This is called a parallax effect and can be turned off by tapping this option to the On position. On/Off Labels: Tap on to show the On and Off symbols on the toggle switches, in addition to the white (off) and green (on) backgrounds and moving toggle. Hearing Aids: For those who use a hearing aid, turning this feature on may reduce interference. Subtitles & Captioning: When this option is on and subtitles or closed captioning are available, they will appear on screen. LED Flash for Alerts: When this feature is turned on, the LED next to the camera lens on the back of your iPhone flashes when iPhone is locked or asleep. It works whether the ring volume is on or not. Mono Audio: This feature changes the left and right sound channels into a mono channel that comes through both sides so those who can hear with only one ear hear both channels. Phone Noise Cancelation: When on, this functions helps reduce ambient noise when you’re on a phone call and the phone is near your ear. Volume Balance Slider: Move the slider right or left to increase the volume on one side or another. Guided Access: Lets you limit iPhone use to one app and even limit features within that app so someone with attention or learning disabilities can stay focused on one task. Switch Control: Allows you to set up new controls and gestures for the various iPhone commands and iPhone functions with an adaptive accessory. AssistiveTouch: Lets you use an adaptive accessory, such as a joystick, to control your iPhone. You can also adjust tracking speed or create custom gestures to make them easier. Home-Click Speed: Adjust the double- and triple-click speed of the Home button. Incoming Calls: Lets you designate the headset or speaker as the default device for incoming calls. Accessibility Shortcut: You can choose to associate a triple-click of the Home button with up to five Accessibility functions: VoiceOver, Invert Colors, Zoom, Switch Control, or AssistiveTouch. If you choose more than one, when you triple-click the Home button, a menu lets you choose which option you want. Custom Ringtones and Vibrations: Create and assign unique ringtones and vibration patterns for individual contacts in Contacts. Voice Control: Press and hold the Home button on your iPhone, the center button on iPhone’s headset, or the button on a Bluetooth headset to open Voice Control. You can ask iPhone to call a person, tell you what time it is, or play a song in Music. Siri: On iPhone 4s or later, Siri, if enabled, performs the Voice Control functions. In addition, Siri can read messages and take dictation, adjust some settings, and do other helpful tasks. Visual Voicemail: In a nutshell, iPhone adds pause and playback functions to voicemail messages and allows you to check your messages in any order you wish. Widescreen Keyboard: Many apps that use the keyboard let you turn your iPhone to landscape position to use a wider keyboard. TTY Support: You can add a TTY adapter to attach a Teletype machine to your iPhone.